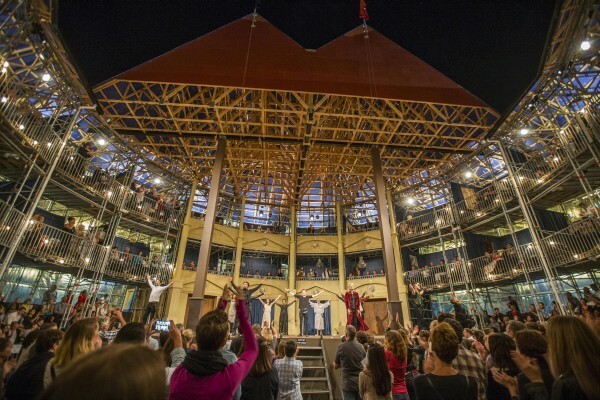 Recently in Auckland we’ve had the ‘pop-up Globe’ (a replica of the Globe at London’s South Bank, which is in turn a replica of the Globe playhouse as it was when Shakespeare wrote for it) putting on nine Shakespeare productions. It has been a huge success, 100 000 tickets sold, 20 000 school children entertained and excited, and the season extended two or three times to accommodate demand. This is something I applaud and approve of, and I hope we will see more of this Anthony Harper company, even if my remarks below about a particular production are in certain respects negative. I saw only one of their productions, Twelfth Night, the comedy in which twins, Sebastian and Viola, thought to be lost at sea in a shipwreck, both survive, though separately, each thinking the other must be dead, and come ashore in Illyria, in the fiefdom of the Duke Orsino, who is currently being spurned in love by the Lady Olivia. Viola disguised for her own protection as a man, is employed as a courtier in the service of the Duke, and falls in love with him. It is her job to make petitions to Olivia on Orsino’s behalf, which she does painfully but conscientiously. In Shakespeare’s day, when women were not permitted on the stage, this would involve a male actor playing the part of a woman pretending to be a man; and it is this element of ambiguity the Auckland production exploited, by having, as in the Elizabethan theatre, an all-male cast. The effect was good and yet not good. 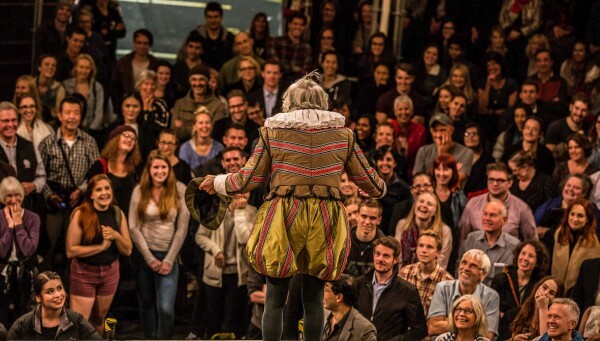 It was hugely successful as entertainment, and the audience was fully engaged, interacting directly with the cast in the way the design of the Globe theatre makes possible. But as something of a purist in these matters, I felt the performance was a travesty of Shakespeare’s text, which depends, as almost everything does in his work (and as a song in this play makes clear), on the distinction between ‘high’ and ‘low’. As I heard those opening lines delivered I said to the person next to me, ‘No, this is wrong’ – and it was. The Duke was played as a fool, lacking all gravitas, which soon made it difficult to understand Viola’s instant passion for him. Later in the play, when the missing brother Sebastian appears, he too was played as ridiculously comic, so Olivia’s falling in love accepting him as a substitute for his twin with whom she has first been enraptured, was equally incomprehensible. Of course there is a sense in which it is all absurd: this is romantic comedy. But that distinction between ‘high and low’, essential to the work as written, was erased. These are resonant romantic lines only Shakespeare could write, and in kind not really matched in English until two centuries later; but to be received in the fullness of their eloquence they needed, not just excellent delivery, but a dramatic context making it possible to take them seriously. Likewise the Olivia could and did speak his/her lines exquisitely. But he camped his part up extremely, as though the comedy derived from the historical accident that men had to play women’s roles, rather than from the actual human situation Shakespeare had developed from the story as found in his Italian source. So when we came to what should have been a step down to the low-life comic sub-plot of Sir Toby Belch, Sir Andrew Ague-cheek and the trick they play on Malvolio, there was little sense of moving from high to low – only more of the same. Of course one can go overboard for ‘poetry’, for Beauty with a big B, and produce another kind of Romantic extravagance. In other words the female roles can be sentimentalised, as it’s said they were in Victorian playhouses. But this is a play that contains linguistic riches that should not be squandered in noisy guffaws or blurred by over-acting. Once an audience is in a mood to laugh it’s easy to keep them laughing. But to run up and down the scale, from low hilarity to high seriousness, is a richer experience, and Shakespeare’s text provides the means for that. Viola, disguised as a young man, is telling and not telling the Duke Orsino that she loves him. The Duke says no woman’s love could match what he feels for Olivia. Duke: And what’s her history? One can certainly acknowledge that the audience was entertained and went home happy; but compared to what this text is capable of, they were sold short and the effect was shallow. These were fine actors; but it seemed they had been encouraged by their director in what the great Shakespearean Harley Granville-Barker would have called ‘dramatic bad manners’. They had not sufficiently respected the text. Images via the Auckland Pop-Up Globe. A few days after I saw this production a piece by Paul Moon appeared in the NZ Herald suggesting that 400 years after Shakespeare’s death it was time to be ‘honest’ and acknowledge his ‘literary and cultural irrelevance’. So those of us who pretended to take his work seriously and to be enriched by it were, it seemed, dishonest. Teachers, he goes on, are the ‘prime culprits in perpetrating the impression of Shakespeare’s ongoing relevance,’ requiring their classes to battle for weeks with ‘archaic language’, ‘puerile jokes’, and ‘verbiage’. He invites us to ‘pity the audiences – often dutiful parents or would-be aesthetes – sitting through Shakespeare enduring tortuous and practically meaningless lines.’ Finally Shakespearean ‘experts’ are mocked for careers built on ‘hyper-ventilated hyperbole’, ‘psycho-babble’ and other manifest absurdities. It was difficult at first to be quite sure what the intention of this piece was, especially coming, as it did, when Auckland enthusiasm for Shakespeare was reaching a high point with the ‘pop-up Globe’ productions. This was a strange time to be expressing ‘pity’ for the audiences. Stranger still, the piece was larded with echoes of phrases from Shakespeare that have passed into common use – the ‘more honoured in the breach...’ one already quoted; then ‘all that glisters is not gold’; ‘dressed in a little brief authority’; ‘most ignorant of what he’s most assured’; and ‘though this be madness, yet there is method in it’ – two from Hamlet, two from Measure for Measure, and one from The Merchant of Venice. This led one letter writer to suggest the article must have been ironic rather than serious – but if that was Moon’s intention it was a massive miscalculation of tone; and in fact I’m sure it can only be read as meaning exactly what it says: Shakespeare is out of date and the fashion for his work is pretentious and insincere. The quotations were there, I suspect, to show that Moon could quote with the best of us, but that he, knowledgeable about Shakespeare as those who failed his 3-question quiz were not, was nonetheless ‘honest’ enough to admit that ‘the Bard, as he is cloyingly referred to by some of his followers,’ has had his day. There are of course linguistic problems with Shakespeare simply because the language has changed over 400 years, and goes on changing. Some words simply vanish from the lexicon; and reading him can be difficult, especially for the less well-educated and/or less linguistically nimble and talented. What is extraordinary, however, is how even a word now almost foreign in contemporary speech, and difficult to understand on the page, makes perfect sense when delivered from the stage, where context creates meaning. Shakespeare wrote always for the stage not the page, and there he is still unfailing. Paul Moon is Professor of History at the Auckland University of Technology. Not everyone is gifted in language; but no one who has the gift can fail to respond to the riches Shakespeare’s work offers – to the sense of a brilliant mind working at a high pitch, almost creating the language as it goes, and with such a range of emotion, such human insight and compassion. Paul Moon illustrates that there must always be people, neither unintelligent nor lacking in usefulness, who lack some receptor mechanism essential to the appreciation of these great qualities. No one should ask of them what they have not the talent for; but nor should they try to redefine the study of English language and literature in a way more suitable to the limits of their abilities. Pop-up Globe is not a replica of the current Globe Theatre on London's South Bank. The existing Globe Theatre on London's South Bank is a replica of the first Globe Theatre (1599 - 1613). Pop-up Globe is the first full-scale, accurate, working dimensional replica of the second Globe Theatre (1614 - 1642). There is no relationship between the two structures, or the companies that run them.